The last of the 29 Navajo Americans who developed a code with their native language to encrypt military messages in World War 2 has died. Chester Nez, 93, of Albuquerque, New Mexico, had told US media he was "very proud" of his part developing the cipher the Japanese never broke. It was credited with saving the lives of thousands of US troops in the Pacific. Nez, who was also a painter, died of kidney failure on Wednesday. "It saddens me to hear the last of the original code talkers has died," Navajo Nation President Ben Shelly told Reuters, adding he was ordering flags to be flown at half-mast in Nez's honour. "We are proud of these young men in defending the country they loved using their Navajo language." Nez was chosen from among 250 Navajos who arrived at the Army base in Arizona for the project. He was in high school at the time of his enlistment and lied about his age. The code took words from the Navajo language, which was spoken by less than 30 non-Navajos at the time, and matched them to military terms. The Navajo word for turtle became "tank", chicken hawk became "dive bomber" and "our mother" meant America. About 400 code talkers used the cipher to relay messages sent from field telephones and radios throughout the Pacific. Messages read aloud by the code talkers were immediately destroyed. 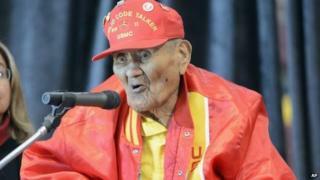 "It's one of the greatest parts of history that we used our own native language during World War II," Nez said in 2010. "The Japanese did everything in their power to break the code but they never did." The Code Talker mission was only declassified in 1968. But the original group received the Congressional Gold Medal in 2001, and the programme was dramatised in the 2002 movie Windtalkers. After World War 2, Nez volunteered in the Korean War, and retired in 1974 after a 25-year career as a painter at the Veterans Administration hospital in Albuquerque. Despite difficulties travelling since both of his legs were partially amputated, he loved to tell his story, said Judy Avila, who worked with Nez on his memoir.